LOS ANGELES - Way up in the reserve seating level at Dodger Stadium, thousands of Boston Red Sox fans screamed, hugged and danced with just as much fervor as the World Series-winning players on the field below. Amid the gleeful chaos, a father in a Red Sox T-shirt and a Bruins cap held aloft his screaming 5-week-old daughter in the chilly Sunday night air, baptizing her in the sights and sounds of another Boston sports championship. The Red Sox had just capped one of the greatest seasons in baseball history with a 5-1 win and a five-game Series victory over the Los Angeles Dodgers. While a hometown celebration will happen on the other coast in a few days, the fans who made it to Chavez Ravine seized every chance to celebrate the final step in their club's fourth World Series title in 15 seasons. Boston players heard them from the opening pitch. That 5-week-old kid aside, most of the partying fans are old enough to remember when the Red Sox stood alongside the Chicago Cubs as the archetypes of long-suffering sports futility. But that was way back before the 2004 title breakthrough ended an 86-year drought, followed by another trophy in 2007 and a third in 2013 with a thoroughly revamped roster. The team changed significantly again over the past half-decade, but the current Sox share their championship predecessors’ big payrolls and even bigger hearts. They dominated the regular season and only picked up steam in October, winning 11 of their 14 postseason games with flair and persistence. Fans’ devotion is often the only constant in the ever-evolving world of pro sports, and the unshakable support the Red Sox receive is rooted in decades of disappointment. The nationwide fan base that once went generations without a championship now has a wealth of success to celebrate from a franchise staking a claim as the 21st century's pre-eminent baseball powerhouse. These Red Sox were the best of all, according to owner John Henry. They roared to a 108-win regular season followed by three straight playoff demolitions of the 100-win New York Yankees, the 103-win Houston Astros and the two-time defending NL champion Dodgers. The Dodgers will be thinking about it throughout another cold winter in Hollywood - and so will their fans, who watched an opponent celebrate a World Series victory on their field for the second straight season. While the Red Sox raged below, the upper-deck fans gathered in a circle and briefly formed a kick line. They sang the parts of "Sweet Caroline" to which they knew the words, and then they came up with a series of Boston-adjacent chants - everything from "Dun-kin Do-nuts!" to "Jay-son Ta-tum!" 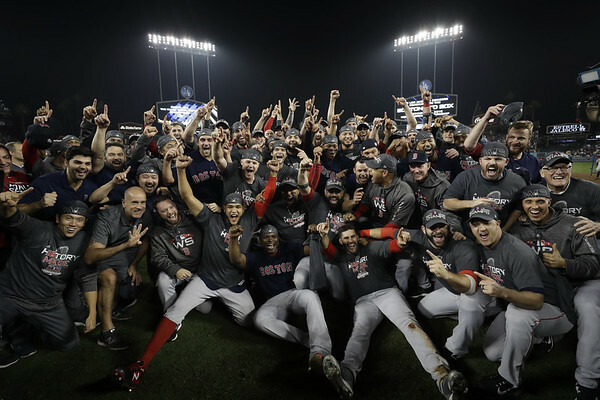 Once the players held aloft the trophy, kissed their families and left the field, the Red Sox partied so hard in the visitors’ clubhouse that the ceiling was literally dripping with champagne and beer. A sound system playing Semisonic's “Closing Time” shorted out when it got wet. The speakers worked just fine when the Red Sox sang along to Frank Sinatra's rendition of "New York, New York," their archrivals' iconic victory song, and Tupac's "California Love," which is synonymous in this Ravine with Dodgers closer Kenley Jansen. Visiting clubhouse manager Mitch Poole estimates he ordered 263 bottles of champagne for the Red Sox at a total cost of $18,000. Poole waited until the sixth inning, when he felt a Red Sox win was imminent, before unboxing the booze and waterproofing the clubhouse. Families, friends and team employees stayed on the field at Dodger Stadium for a couple of hours after the final out, soaking in the afterglow. Given the talent level of the Boston roster and Dombrowski's flexibility to improve it, the Red Sox should be in contention for another one of these celebrations one year from now. But this Hollywood night will linger for the players who made it happen and the fans who witnessed it. AP freelance reporter Jolene Latimer contributed. Posted in New Britain Herald, General Sports on Monday, 29 October 2018 12:37. Updated: Monday, 29 October 2018 12:40.